Please realize that some of the “before” sites you are looking at may have been created by a web design company, a friend of the client featured or by the client themselves. It is not our intention to bash anyone’s design ability, but simply to illustrate the difference a website redesign can make. As a side note, some designers get better with time, so we’ve included some of our own designs from early on - that we redesigned later. Click on the images below to view enlarged. 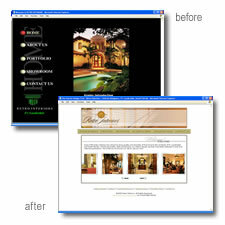 OBJECTIVE: To create a professional website that reflects the quality of work that they actually produce. 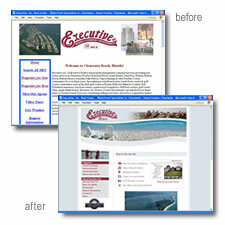 Since they offer multiple services, our task was to create a site that succinctly showcased their talent. 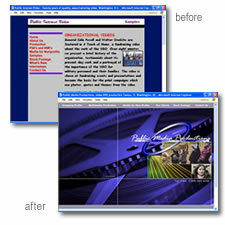 We incorporated Flash in the home page and throughout to help convey the multimedia aspect of their company. RESULTS: The site is now easy to navigate, communicates the professional quality of their work and creates a beautiful corporate image. They are able to easily promote the website and are now confident in using it as a marketing piece. OBJECTIVE: Our task was to create a beautiful website that clearly reflected the high-end quality of this residential community. The site is designed to appeal to higher income prospects, and to assist in pre-qualifying those that request a full information package on these homes. 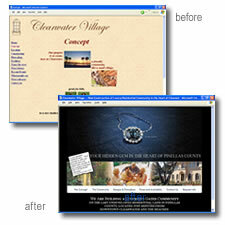 RESULTS: After the website was redesigned, they were able to confidently promote the website address. They get consistent leads, but more importantly, the quality of their leads have increased 100%, with most inquiries being fully qualified prospects. The new site design has received numerous kudos from prospects, our clients and even our competitors. OBJECTIVE: To showcase the skill and work in a way that actually reflects the talents of this high end Ft. Lauderdale Interior Design firm. RESULTS: The website is very high end, incorporating a lot of imagry and flash, conveying the message that this is a top notch interior design firm. The new design showcases their work beautifully and their website is one of the best in all of Florida for interior designers. OBJECTIVE: Our objective was to create a website that appeals to affluent home buyers, agents and to those selling their homes. The site had to be designed to communicate high-end, while being easy to navigate. RESULTS: The redesign accomplished all of the above. The site is professional, user friendly and has received a large number of compliments. It is a much better reflection of the quality of the homes they represent.